Now that Meetup.com has decided to start charging for its services, the world needs a free alternative to Meetup.com (a website that makes it easy to find people in your city meeting around a common interest e.g. The Victoria Great Dane Meetup Group, The Victoria Punk Meetup Group, The Victoria Indie Publishing Meetup Group, The Victoria Anarchy Meetup Group, etc.). I'm going to make a free alternative to Meetup.com, and I'm calling it Meetr (name inspired by Flickr). 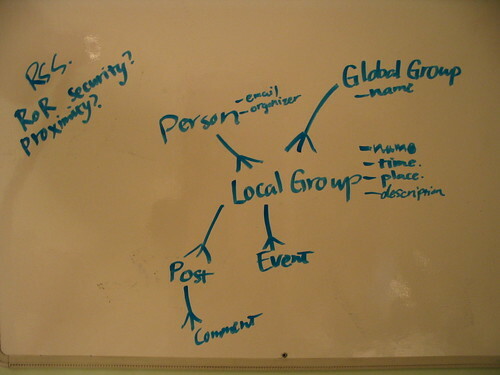 I've sketched out a database model below -- if anyone has any suggestions, I would be grateful. posted by Jonathan at 5/20/2005 10:50:00 p.m.
Tagging would be good to build in. Maybe for version 2. Implementing tags is evidently not as easy as it seems -- there have been a couple of recent articles on how to do it. By Jonathan, at 5/20/2005 11:02 p.m.
By Jonathan, at 5/20/2005 11:04 p.m.
By Jonathan, at 5/20/2005 11:05 p.m.
Use del.icio.us to provide RSS feeds, perhaps? By Jonathan, at 5/20/2005 11:12 p.m.
A wiki for the group page? A blog template? Some way to give groups control over how their home looks. By Jonathan, at 5/20/2005 11:15 p.m. Didn't you recommend switching to Andy Baio's Upcoming.org about a month ago? Why make something new? By Vito Miliano, at 5/21/2005 12:17 a.m. I will tell Upcoming.org about these missing features. Maybe they will save me the trouble of building this new system! By Jonathan, at 5/21/2005 7:48 a.m.
Embedded Google Maps for the venue. By Jonathan, at 5/21/2005 7:58 a.m. Interesting (if fairly ambitious) project, Jonathan. Get on registering that domain name at least (hmm, is the .com already taken?). And I'd be into helping with the design. By Jeff Werner, at 5/21/2005 2:26 p.m. Thanks Jeff! Why not, hey? By Jonathan, at 5/21/2005 2:34 p.m.
Did you ever get your Meetr project finished? I notice it's been about 6 months since your blog said anything about it. By DeltaYankee, at 11/15/2005 10:56 a.m.
Hi deltayankee - yeah, I cancelled it because of other commitments. But I now work for a company called Ning, which makes it easier to build social apps like Meetup (for free), so hopefully someone will step up! By Jonathan, at 11/17/2005 12:32 a.m.
By Andy Goldman, at 7/10/2006 5:04 p.m.
By Anonymous, at 8/15/2007 7:55 p.m.